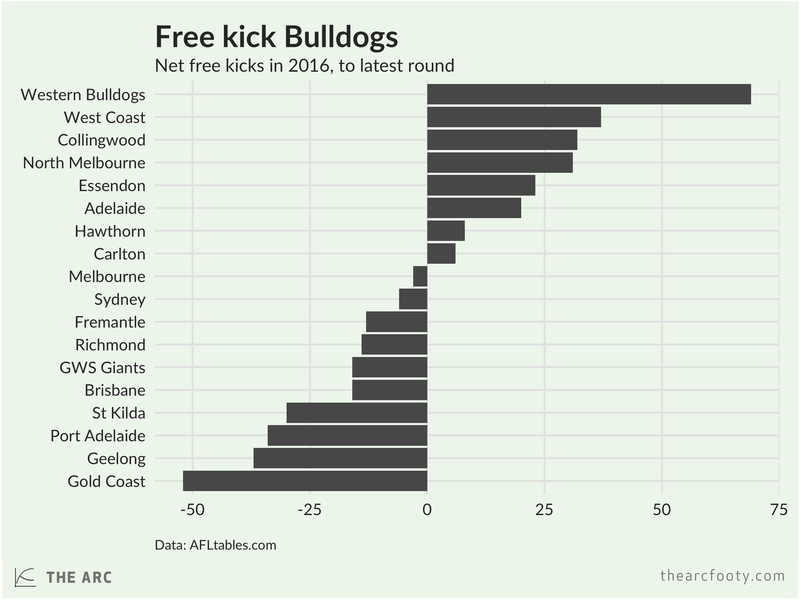 After round 7, the Bulldogs had received 67 more free kicks than they’d given away, by far the highest net free kick count in the league. Since then, things have changed. Between rounds 8 and 15, the Dogs received only two more free kicks than they gave away, taking their season net free kick total to 69. Meanwhile, other teams have caught up a little, with West Coast, Collingwood and the Kangaroos all now sitting on more than 30 net free kicks for the year. The least favourable free kick count for the season so far goes to Gold Coast, which has a net free kick count of -52, followed by the Cats on -37. The Bulldogs’ early run of consecutive games in which they didn’t have to leave Victoria probably contributed to their strong early showing in the free kick count. Teams generally receive a much more favourable free kick differential in their home state than elsewhere, as you can see below. The Eagles, for example, average 5.1 net free kicks when playing at home in Subi, while they average -0.7 when playing interstate. The home state-interstate split is even more stark for Adelaide. We’ll keep an eye on these stats over the remaining rounds, to see if the Eagles can displace the Dogs at the top of the free kicks ladder.